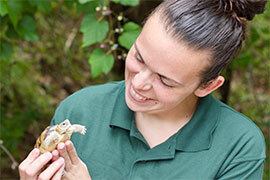 For Danielle (Leopold) Regan ’10, life is a zoo — literally. Regan was majoring in biology at Stetson and planning to become a high school agriculture teacher. Then her SURE (Stetson Undergraduate Research Experience) grant changed everything. Goodbye, agriculture. Hello, banded water snakes, Panamanian golden frogs, Egyptian tortoises and Chinese alligators. “I found my passion for these scaly creatures when I did my student research project at Stetson,” said Regan. Today, Regan is area manager of the Maryland Wilderness and Panamanian Golden Frog Team at the Maryland Zoo in Baltimore, where she frequently handles those exotic animals. She has worked the past seven years as a zookeeper. Regan’s transformation went on display during her senior year when she presented at Stetson Showcase — a daylong event each spring where students share their research through oral presentations, portfolios, posters, readings, music and theater performances, art exhibits, and multimedia work. Regan’s showcase detailed her research on whether banded water snakes, a species native to Florida, could “consume a far more challenging prey,” an invasive species of “armored” catfish known as the brown hoplo. Stetson Showcase celebrated its 20th anniversary in spring 2018, with student programs ranging in topics from media portrayals of African-American women in the workplace and Godzilla as a metaphor for nuclear war to social media’s impact on cryptocurrency. In all, there were more than 200 presentations encompassing medicine, literature, business, international relations, science, music, art, religion, philosophy, politics, race, gender, sexuality and other fields. Participation in SURE, a competitive grant program in which selected students undergo an eight-week, research-intensive experience during the summer under the mentorship of a Stetson faculty member, is required to present at Stetson Showcase. Often, as was the case with Regan, Stetson Showcase is a launching point for careers. Other times, Showcase simply represents the culmination of an undergraduate’s study. Either way, the program speaks to “an embarrassment of riches in undergraduate research” at the university, according to Kimberly Reiter, Ph.D., associate professor of ancient and medieval history and chair of the Stetson Undergraduate Research Committee. Reiter also serves as a national councilor for the Undergraduate Research Directors Committee for the Council of Undergraduate Research. “We have a wealth of research from which to draw. I go to [national council] meetings, and I have to try very hard not to keep interjecting, because a lot of talk is about ‘How do we get undergrads to do research?’ … When it comes to Showcase, we don’t have to scramble for people. We’ve got them,” Reiter asserted. Students design their showcases for other students and faculty plus the general public, and their work is judged not only on content, but also how that content is communicated. Soprano Jenna Siladie ’11 made her first trip abroad to Austria with a SURE Grant to study lied (German art song — that is, poetry set to classical music) at the Franz Schubert Institut. Siladie lives in Vienna, where she sings as an ensemble member with the opera house Theater an der Wien. It’s far from her Stetson home, but lessons learned remain near. “Even now, I sing many times for people who have never been to the opera or to a vocal recital before, and it’s always a pleasure for me to show the humanness and accessibility that comes with these stories and songs,” she said. 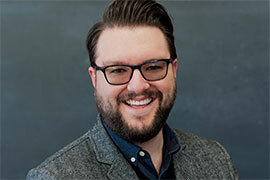 Michael Paul Cartledge II ’13 majored in communication and media studies at Stetson, and today he is using those skills as a doctoral student in practical theology at Princeton Theological Seminary. To read the remainder of the article, starting on Page 40, click here.